Checked out Ken Solomon’s new exhibit at Hotel Casa del Mar on Wednesday. The Santa Monica hotel has collaborated with curator Cynthia Greenwald to stage the show as part of their Live Well Again Artist Series. From January 26th through mid April this New York artist’s creations will be featured with this exhibit focusing on issues of identity and appropriation on the canvas of the internet. The hotel proclaims that Solomon’s new paintings are detailed, reconstructed snapshots of the ever-changing internet in an attempt to slow down the constant flow of information on the web. When asked why he paints web pages, Solomon explains, "... if it's done by hand, they're going to look at it from a different perspective." 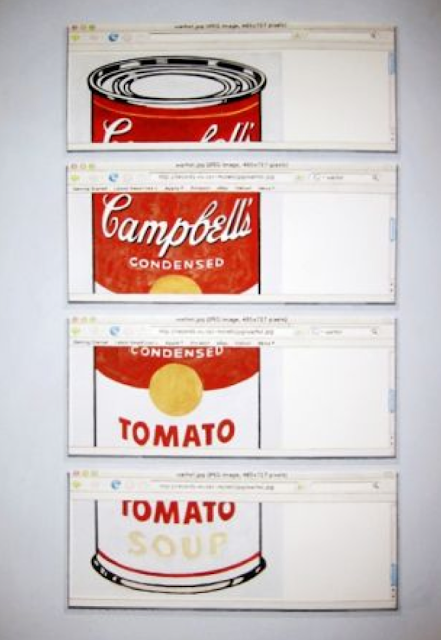 A group of Google Portraits are fossils of digital information, as they translate the results of Google image searches into watercolor (like the above Campbell Soup can first immortalized by Warhol now Post-Modernly mixed by Solomon). "I feel like the Google image search is sort of our contemporary dictionary," he adds. So if it’s a fun little jaunt if you’re looking for with a heap of culture topped onto your Santa Monica sunset drink than Casa del Mar is the place to go. I wasn't around to make it (I was getting no sleep whatsoever in Park City Utah!) but I heard the event was awesome! So why do I even know about this place if I won't be shopping there anytime soon? 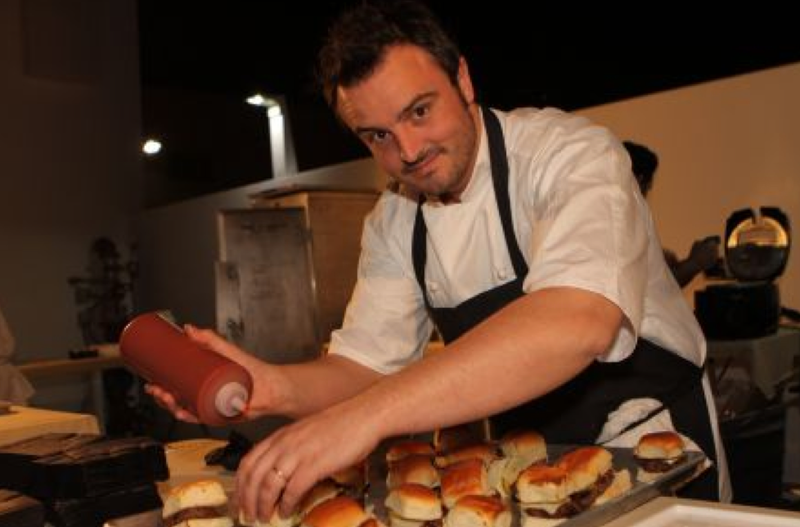 Working with their media partner Los Angeles Magazine, Bay Cities has amazing food events where you can have some of the hottest chefs in town teach you about cooking (and ultimate bonus they also cook your meal in the process). The opening (which happened last Thursday on Jan 20th) had Los Angeles Magazine host the food catering by their #3 pick for the year for their January issue, “Best New Restaurants, Waterloo & City by Chef Brendan Collins. Yum, yum, yum. Plus they gave out free "Best New Restaurants" magazines to all the guests. So even though you missed the opening (as did I) check Bay Cities for up and coming educational and tasty food events (like the one I went to taught by Neal Fraser)! 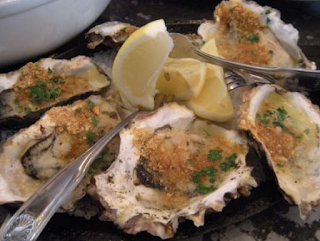 “I adore anything mollusk,” my little sis Kelly utters as we walk in, “you’re eating the ocean in a good way.” And if you’re looking mollusks on the Westside (or really in all of Los Angeles) there’s only one place to go: Blue Plate Oysterette. Oysterette, the name says it all. Since it opened a year and half ago, the Oysterette has blossomed from a place that served a few oyster choices into one that has over sixty-five different oysters rotating throughout the year. And the mechanics do their work well, during a busy night BPO does somewhere between 800-900 oysters. They day Kelly and I were at Blue Plate Oysterette we had the gambit of oyster choices. 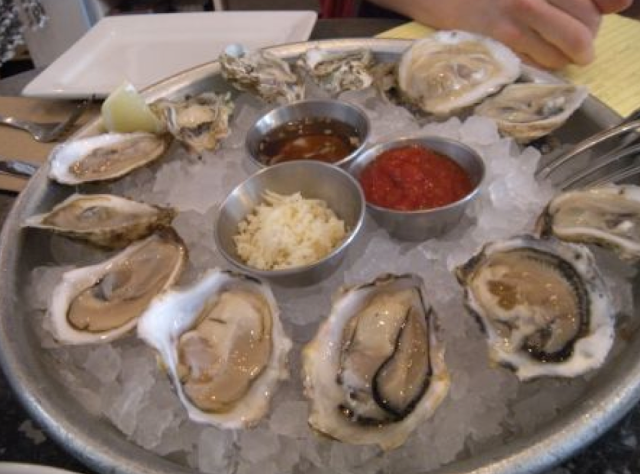 Komato (tight and creamy), Easterns (Briney with a smooth flavor), Lunas (sweet and delicate), and Beau Soleil (which means beautiful sun, and the creamiest oyster I have ever had, amazing!). Positively simple in concept (diced raw shallots mixed with compound butter, bread crumbs and tarragon) but amazing amazing fantastic. Yum with 3 M’s (as Kelly says). Last Tuesday I was at the DineLA party, and yes the oysters were lovely, but they were moon to Blue Plate Oysterette’s sun, nothing but a pale comparison. I passed on trying another; the bar had just been set too high. Hey Guys, I know it's not super food related, but my article on Venice do-gooder cartoonist Denis Thomopoulos ran in the SM Observer last week and I figure since it's such a great concept and cause the more people who read it the better. Please enjoy! Simon Says “Let’s Stop Climate Change!" Last week, the first week of 2011, I went for a barefoot run on Santa Monica’ beaches, where I narrowly avoided stepping on not one, but two hypodermic needles. Now if that’s not a signal for our need for change, to really step up and do our part to help the planet I don’t know what is. And where does change begin the most? With education. As Henry Steele Commager once said, “Education is essential to change, for education creates both new wants and the ability to satisfy them.” Something that Venice cartoonist by Denis Thomopoulos is taking to heart. In early December Thomopoulos hosted a solar powered premiere screening party of his new DVD Simon Says “Let’s Stop Climate Change!” This half-hour feature DVD uses characters from his Hippo Works’ syndicated eco cartoonlet It’s A Jungle Out There! to teach kids about global warming, the food chain, carbon footprints as well as eco habits such as “the Three Rs” (reducing, reusing and recycling). A pretty big concept for little people, but one that can make the biggest difference on this planet. See it’s really about marshmallows, yes marshmallows. Walter Mischel is famous for doing a study on marshmallows. In the late 1960s, he put preschoolers alone in a room with one marshmallow. Mischel told each kid if they didn’t eat that marshmallow, that when the adults returned they would be rewarded with two marshmallows. Turns out the kids who were able to hold out the longest, who were able to use their willpower to delay gratification, were the ones that were the most successful later in life: they had the highest SAT scores, the lowest rate of divorce, etc. But the most important part of Mischel’s study (in my opinion) was the concept that these children through education could be taught to delay their need for that marshmallow. That they could see beyond the marshmallow in front of them, or that disposable coffee cup, or that plastic bag, to the bigger picture. Most people wouldn’t think about explaining carbon offsets to a little kid. Including Denis Thomopoulos. His company Hippo Works.com, began by launching a weekly ‘eco cartoonlet’ called It's A Jungle Out There! and syndicated it to companies like AOL Kids and National Geographic Kids, to mobile carriers, and most recently to retail video displays around the country through Indoor Direct. It was only after Denis began to receive a lot of fan mail for his cartoonlets on climate change that he realized there was nothing in the audio-visual market that offered kids a comprehensive understanding of this important issue. Thus, he created the half hour feature Simon Says “Let’s Stop Climate Change!” to fill that void. Thomopoulos created Simon Says “Let’s Stop Climate Change!” as a tool for education; education that could happen both at home and at school. Thus, Simon Says “Let’s Stop Climate Change” has fully indexed chapters that correlate to National Science Standards and a 45 page eHandbook with teacher lesson plans, puzzles, and more. “The DVD is broken into three parts: the problem, the effects, an what we can do to stop it; on what kids can do. I wanted to make sure there was a solution for them,” notes Thomopoulos. At the end of the film the Hippo Works characters (including the aptly named Simon) have a Climate Change bake sale, and Thomopoulos explains that numerous kid fans, inspired by the DVD, have done the same. In addition to the DVD and his syndicated weekly, Denis has created eco cartoons and products for clients such as The Lightspan Educational Network, National Geographic, Paramount Vantage, Con Edison, EarthDayNY.org, SWAPE (Soil Water Air Protection Enterprise), GlobalWarmingKids.net, StopGlobalWarming.org, Wildsalmon.org, Care2.com, and others. Thomopoulos understands that change comes in the details, simple understandable details that a little person (or little person’s parent or teacher) can understand. Simple details like packing lunch boxes with reusable containers (since in the United States lunch box waste is over 1.5 billion pounds every year) and planting trees (since one tree removes one carbon ton). This concept also translates to Hippoworks.com as a whole. 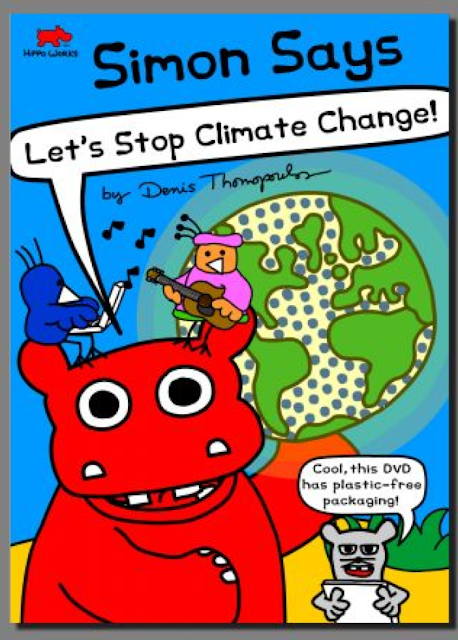 The Simon Says “Let’s Stop Climate Change!” DVD cover was made locally in Los Angeles, and has plastic free packaging. Hippo Works is powered by renewable energy, clothing and products are made from organic cotton and recycled papers, and offsets are purchased to make Hippo Works a completely carbon neutral company. And all of these details are marshmallows. Marshmallows that allow us (kids young and old) to change. To help us live in a world where we can breath clean air and swim in (and run next to) a clean ocean (free from hypodermic needles).